Over the weekend accusations of racism by Catholic school boys towards a Native American counter-demonstrator at the March for Life on Friday led to the Mainstream Media spreading the allegations like wild-fire, as it spread on social media like a plague. Quickly, death threats towards the students ensued from Hollywood and Americans around the nation. By Sunday afternoon, new evidence in the form of the video surfaced, showing that it wasn’t the Catholic boys who were being racist or threatening, but from the Indian, and a group of black counter-protesters against the ‘Right to life’ demonstrations. Now, authorities are concerned and have released statements, as the boys and their families have had their lives threatened. The video quickly went viral, as it was edited to cut out the majority of the video, so as to depict the children as making fun of the Native American Indian Vietnam Veteran. In fact, the video reported by the Mainstream Media painted the boys as mocking the Indians on the Lincoln Memorial’s steps, as Nathan Phillips, the Native American drummer, walked towards them. The student’s gestures were perceived as mocking him. Slate then said that the boy’s actions were tied to the President’s criticisms of Senator Elizabeth Warren, and her claim to Native American heritage. Within 24 hours, the boys were receiving threats and harassment from people whom they knew, and people they had never heard of before. Then, by Sunday afternoon, less than 24 hours after the Hollywood Reporter broke the story, new videos showing the incident in its entirety began to surface. Also, it began to shine a new light on the event. Ironically, the following videos were not even posted by the Catholic boys, but instead by the radical left-wing activists who had been taunting the boys, before Phillips got involved. Meanwhile, Phillips was beating on his drum, as the boys ignored the black men’s slurs, and danced to the beat of the drum. The boys said at first they thought that Phillips was banging the drum to the beat of their school song. Meanwhile, Phillips approached the students, who were already there on the steps, despite his claims that they surrounded him. Furthermore, the full video showed even more problems with the claims made by Nathan Phillips and the Mainstream Media. For example, Nathan Phillips account that he “tried to keep the peace between a group of mostly white students attending a March for Life event and a gathering of about four black members of a religious group known as the Black Hebrew Israelites,” was not actually the case, but instead, he approached the boys as they began chanting to his drum beat. Then, he walked up to one boy with a MAGA hat as they began staring each other down, neither one speaking or moving. However, they were not even saying to “build the wall”, and it was the black men who were yelling racial slurs and threats at the boys for wearing MAGA hats, and their skin color. The racial slurs were caught on video. Phillips other claims that he told the Washington Post about the fact that “he felt threatened by the teens and that they swarmed around him” was completely inaccurate, as the boys never moved, and as Phillips along with some of his friends, and the radical left counter-protest black group surrounded the boys, as they hurled threats at the school kids. The Gateway Pundit also pointed out that Phillips had been involved in similar occurrences like this before, as he accused college students elsewhere of hurling racial slurs and threats. Phillips reported it immediately to the news, and campus police investigated, but no evidence of threats or violence was ever found. 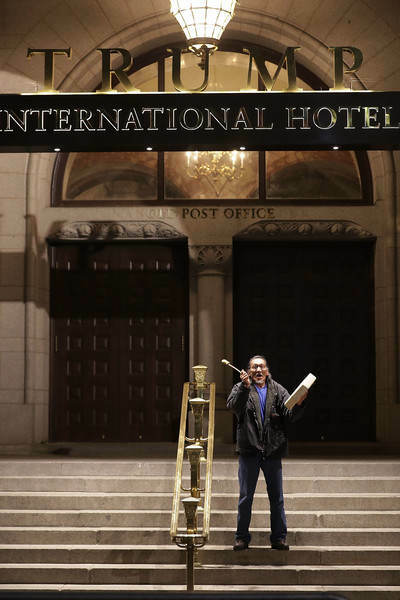 Also, Nathan Phillips has previously attended anti-Trump protests in April of 2017, when he had his picture taken in front of the Trump International Hotel in Washington, D.C., where he said that he was protesting against President Trump’s environmental policies. 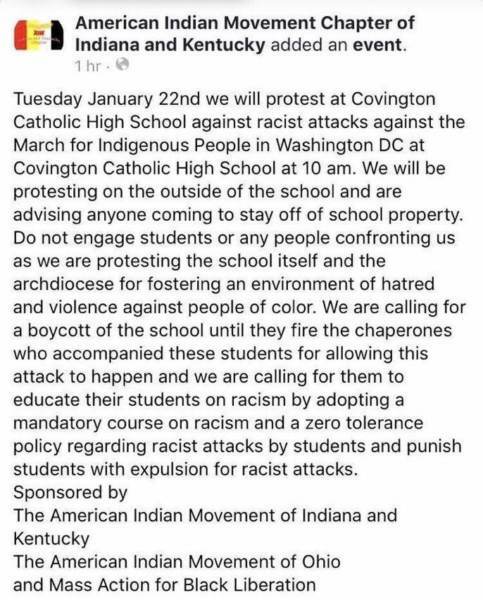 Now, the parents and students from Covington Catholic are demanding an apology from the diocese, which they have yet to get. However, the retractions are just now beginning to emerge! Scott Adams apologizes for believing @CNN about the Covington Catholic Boys fake news. With coffee. In addition, the Associated Press admitted that Marcus Frejo, a member of the Pawnee and Seminole tribe said that the children were singing with them, and not making fun of them. Meanwhile, the RINO anti-Trump publication National Review didn’t even have the guts to retract their comments, but instead silently took down their attack piece on the Catholic boys, who happened to be wearing ‘Make America Great Again’ hats down. Now, the Polish Catholic Parliamentarian Tarczynski Invited the Covington Pro-Life boys to come and speak in Parliament after they were wrongfully accused and attacked. 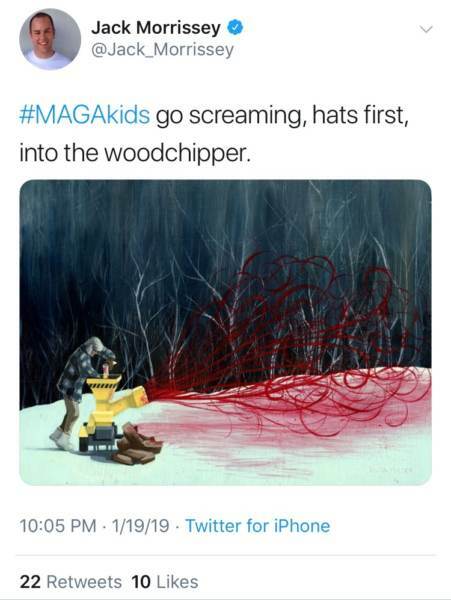 Sadly though, as a result of the out-of-control Mainstream Media, which has taken their anti-Trump hate to an all new level, they have spun a web-of-lies that has grown into threats of violence against pro-Trump children. 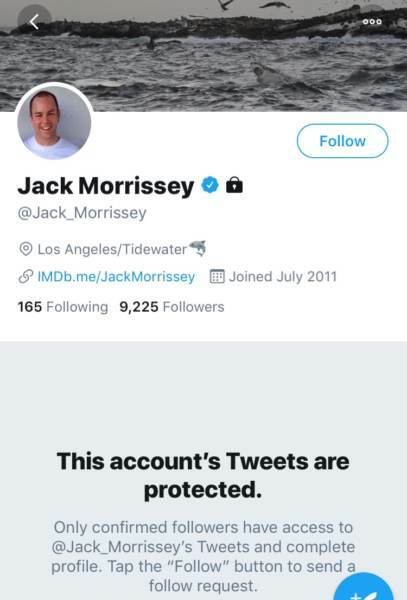 Sadly, Twitter once again protects the radicals on the left, and is protecting his account, and refusing to remove his tweet, regardless of its violent threat! Sadly, this is what happens when the media loses sight of responsible reporting, allows accusations to become convictions, and allows mob justice to prevail before all the facts are given time to ascend to the surface. Unfortunately, although few will learn from the injustices of this incident, one thing has become apparent. Americans cannot trust the Mainstream Media or Hollywood hate-mongers! They only care about bringing hate and violence down on President Trump, and anyone who dares support his Presidency and agenda. We cannot rely on Social Media for truth, because the truth that the Silicone Valley tech giants allow, is rarely truthful! Furthermore, leftists and so-called RINO (Republican In Name Only) Republican news organizations including Bill Krystal and the National Review should be ashamed of their actions this weekend, as well as, their actions over the past few years. Today, anti-Trumpsters and Progressives will do anything to smear those who hold ideological differences of opinions, rather than looking for ways to work together! Sadly, even the Catholic School and diocese itself should be ashamed of themselves, because instead of looking at the facts to make a determination for the course of action to take, they allowed the Mainstream Media, social media, and the public mob-like anger to influence them to make a rash judgment and condemn the school children and make threats of punishment and expulsion fo the students, regardless of not having all the facts! Now, it is time to reign in the anger, allow the children to be children, and not allow the radical Marxist mob-like mentality to spread like a weed in the garden. Instead, it is time for ‘We the People’ to stand up to the Mainstream Media’s lies, allow the truth to the surface before allowing conclusions to pervade our minds. Otherwards, whether we are conservative or liberal, or socialist or capitalist, we will be no better than the radicals who spread hate, vile words, or threats of violence.